Enhance your cherished rings with one of our beautiful ring guards. Perfect for adding pizzazz to a solitaire band, or creating a whole new look for any of your rings, a ring guard is an essential addition to your jewelry case. Adding a gemstone enhancer to honor the month you were married is a unique idea. Check here for additional designs. 14k White Gold lovely Sapphire Ring guard. This solitaire ring guard is set with 14 Sapphires ranging in size from 2.7mm to 3mm round. Sapphires total approx. 2 ctw. Stock size 6. Custom order your size. 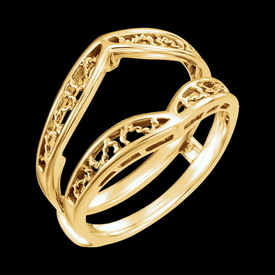 Pretty 14k Gold filigree design ring guard. 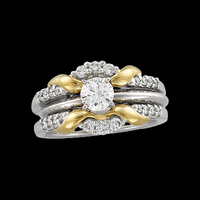 Available in 14k white, 14k yellow, and by special order Platinum. Stock size 6-7. 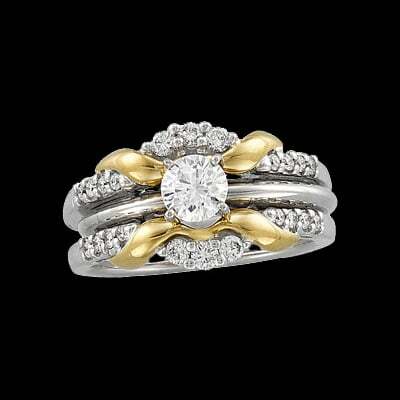 Pretty 14k White or Yellow gold bridal diamond ring guard. Diamonds total 1/3cttw and are SI clarity G-I color. This ring guard looks great with a round, marquise, or even princess cut diamond. Diamond ring guard measures 20mm across. 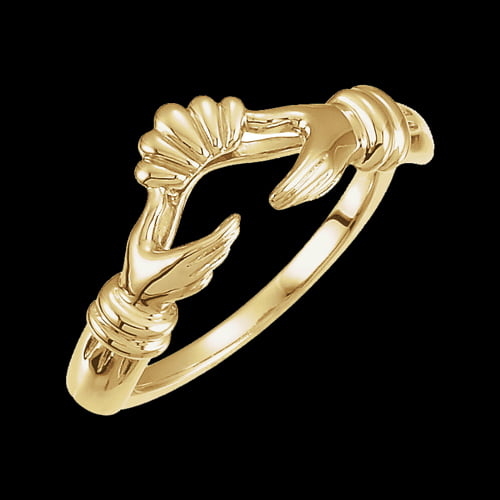 Pretty 14k Yellow or White gold Claddagh ring guard. This unique design is a nice accent to your diamond solitaire. Special order in Platinum. Bridal Sapphire Ring Guard. 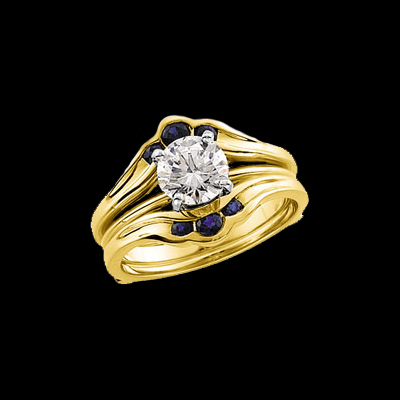 Wrap your beautiful solitaire with this Sapphire and 14k Gold Ring Guard. 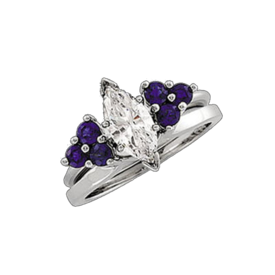 This delightful ring guard is shown with a 1 carat marquise solitaire but looks great with additional solitaire shapes as well. Sapphires total .66ctw. Lovely 14k Yellow gold genuine Sapphire ring guard. Great design, sapphires measure 2.5mm and 2mm round. 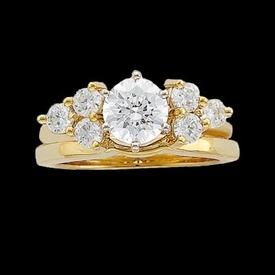 A pretty enhancement for your diamond solitaire. 14k Yellow gold Ruby ring guard. Genuine Ruby's measure 2.5mm and 2mm round. 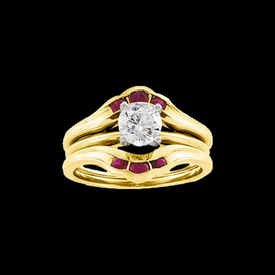 This pretty ring guard adds a little splash of red to your gorgeous Diamond Solitaire, guard weighs about 4.46grams. Beautiful simple design. 14k Two Tone diamond solitaire wrap. 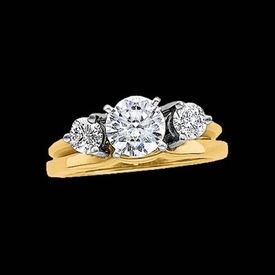 Diamond on either side of your solitaire are each 1/4ct for a 1/2ctw. Diamonds are SI2 clarity G-I color. This ring measures 5.75mm in width. A lovely diamond solitaire wrap. sizes other then stock size are considered custom and non returnable. 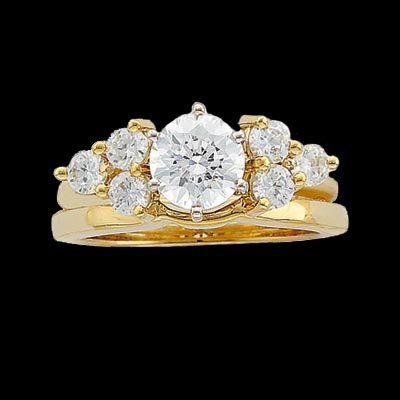 Pretty 14k Yellow gold diamond ring guard. Diamonds are channel set on either side and total 1/4ct tw in this guard. Diamonds are SI 1-2 clarity G-I color. Lovely 14k Yellow or White gold diamond bridal wrap. This diamond wrap is a lovely addition to any diamond solitaire. Diamonds total 1/2ct tw, each 1/4ct round diamond is SI 2 clarity G-I color. This diamond bridal wrap measures 5.8mm in width. Such a lovely addition to your solitaire. Now also available in 950 Platinum. 14k White gold diamond solitaire ring guard. Diamonds total 1/4ctw in this lovely design and are SI clarity G-I color. Channel set diamonds are princess cut stones, round diamonds are set around the solitaire. Lovely 14k Yellow gold diamond bridal ring guard. Diamonds total 1/2 ct tw and are SI 2 clarity, G-I color. 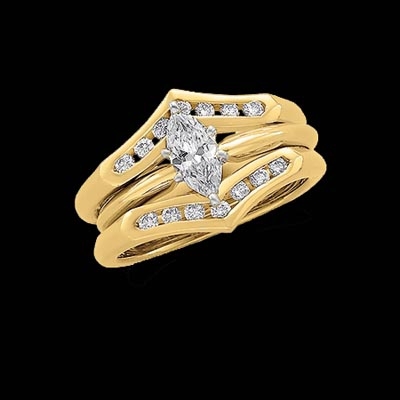 A beautiful diamond accent to your stunning solitaire. 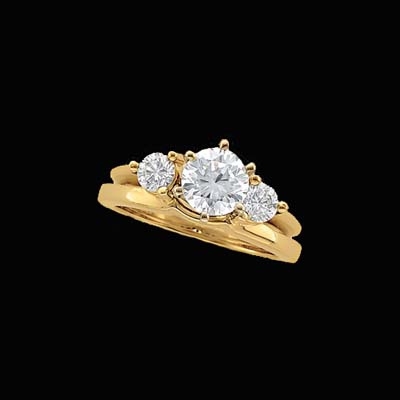 Pretty, simple design 14k yellow gold diamond marquise solitaire wrap. Diamonds total 1/10ct tw, wrap shown with a 1/4ct round diamond solitaire (sold seperate). This diamond ring guard measures 8.4mm wide. 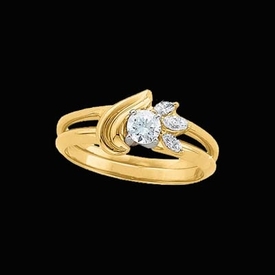 Simply gorgeous 14k White or Yellow gold marquise diamond solitaire wrap. A fabulous compliment to your solitaire. Diamonds are SI 1 clarity, G-I color and total aprox. .11cttw. 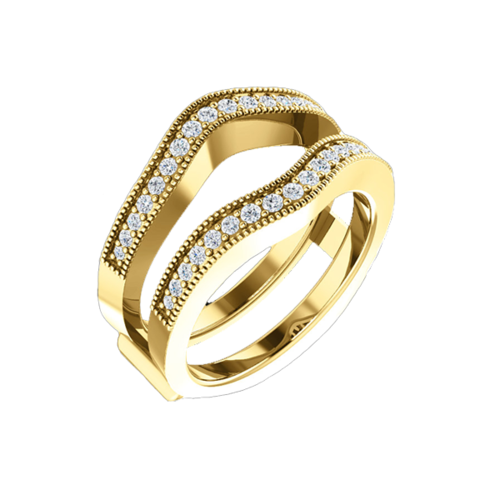 14k Gold Diamond ring guard. This ring guard design is available in 14k Yellow, 14k White, or Platinum. Diamonds total aprox. 1/4ct tw and are SI 2 in clarity, G-I color. Pretty 14k Gold diamond solitaire wrap. Diamonds total 1/6ctw in this wrap design. Diamonds are SI 2 clarity, G-I in color. Diamond wraps or enhancers are a great way to accessorize your solitaire. 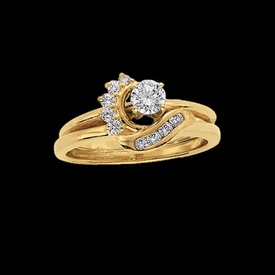 Fancy Gold Diamond Ring. 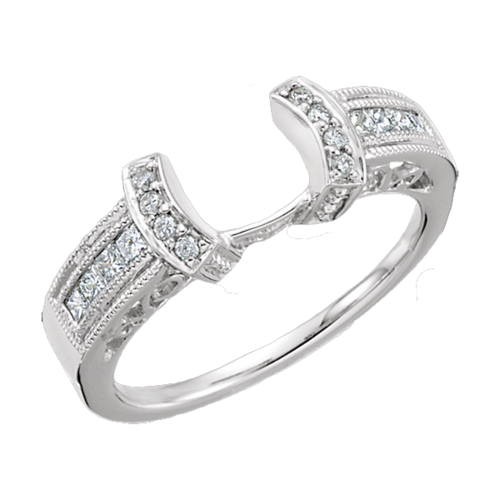 Pretty 14k White Gold diamond ring enhancer. Diamonds total 1/3 ctw in this beautiful solitaire enhancer and are SI 1-2 G-I color. Ring enhancer is stocked in size 6. Bridal enhancers are a great accessory, one is rarely enough. 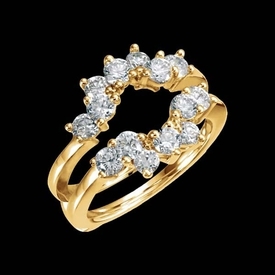 Pretty 14k yellow gold diamond ring guard. This ring guard is set with 1/2ct tw diamonds. Diamonds are SI 2 clarity G-H in color. Ring guards are a great accessory to your beautiful diamond solitaire. Collect a few different styles for your different moods. This design is somewhat on the nautical or western style. Beautiful 1 1/4ct tw Diamond ring guard. 14k Yellow Gold shown, special order in 14k White gold or Platinum. Diamonds are SI G-I color. Stock size 6, custom order in your size. This diamond ring guard measures 12.2mm in width. We're happy to size this item for you but sized items are non returnable and will add 4-6 business days to shipping.